Given the fact that I’ll be packing Fuzz’s lunch every day for the next 9 month (or better yet, Fuzz will be packing it!) , I happily accepted a free sample of LesserEvil snacks. You may recognize the name from their kettle corn. 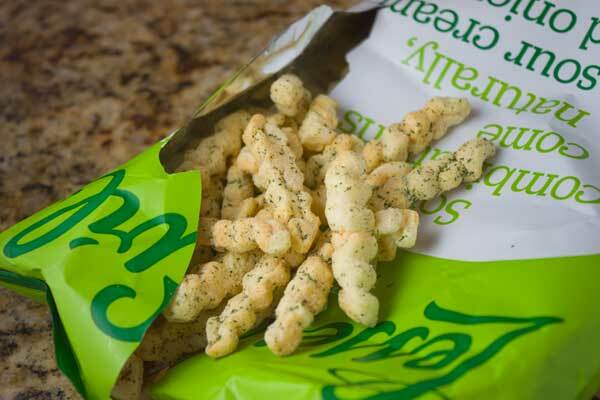 It’s been available for a while, but now they are making a baked vegetable chip snack called Krinkle Sticks. Gluten free and with 50% less fat than typical chips, these are exactly the type of thing I look for in the salty snacks aisle. So how were the samples? Based on my tastings, I’ve determined they may be a “lesser” evil, but they’re still a little evil because they are impossible to put down. My favorite flavor was definitely the Sour Cream & Onion, which tasted surprisingly less “fake” sour cream-y than some other snacks. Not that I mind fake sour cream& onion flavor (it’s what I grew up with), but Todd typically doesn’t not like sour cream & onion flavored chips, yet he loved these. We also liked the shape. Aren’t they pretty? They’re light and puffy so a typical one ounce serving takes up more room on a plate or in a small zipper bag. And as mentioned, these are just perfect for school lunches. 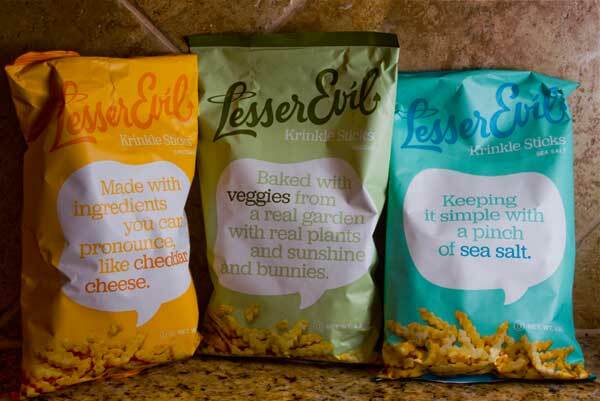 LesserEvil’s premise is that snacking is a good thing when you’re snacking on the right thing. I buy into that, but only if you can keep portion control in check. Because these are so very good, it’s easy to eat too many, so I recommend portioning them out ahead of time in little zipper bags. They’ll be ready to throw into lunch boxes or grab for snacks. These look really good! I know I would love something like this. Haven’t seen those before. Now I’ll have to look for them. Does your daughter pack a lunch every day? My friend makes her daughter Bentos–these snacks would look so cute in the little ‘holders’ in Bento boxes! Can i buy these in Canada? I just returned from a loooong road trip. These would have been a welcome snack. The portion control is a great idea!